By 1891, just seven years after the death of Karl Marx, the German Social Democratic Party was officially wedded to the nascent ideology of Marxism. During the 1880s mass labour movements had emerged in most of the industrialized countries of Europe and, outside the Anglo-Saxon world, many of these shared some sort of affinity with Marxism, if only because of the tireless salesmanship of Friedrich Engels. Marxism took root within the movements themselves, however, because of its popular association with the ‘positivist’ sciences of its day – a sort of rational economic system analogous to Darwinism in biology. Even as German industry entered its great period of pre-War expansion, the SDP1 was becoming a truly mass party, the pre-eminent socialist organisation in Europe, standing at the head of the pan-European Second International. Despite the often vague political convictions of its rank and file, and the amorphous character of its ‘official’ Marxism, it might have seemed that Marx’s predictions were coming true. After a prolonged period of crisis following the 1873-1879 Great Depression, mass recruitment of the proletariat was indeed taking place in roughly the way Marx would have imagined. A parliamentary Party, bolstered within industry by mass trade unions, struggled for real improvements in the lives of workers, but also agitated and (at least in theory) organised for revolution. The passage merits quoting at length not only for what it says about the character of Marx (i.e. he was frankly misanthropic when it came to dealing with the company of socialist others), but also because it hints at a deep confusion within Marxist thinking itself. At times Marx could argue vociferously against any form of so-called “class compromise” – that is, getting on with political life under capitalism to the detriment of the revolution. While at others he takes the minimal level of political freedom that stems (apparently naturally) from capitalism as the space necessary for revolutionary organization to take place. What, in practice, amounts to compromise and mere reformism, on the one hand, and anticipatory revolutionary organization, on the other? Benjamin’s point is simple: that by worshipping technological progress, the German movement ended up selling its soul to capitalist development, on the promise of material improvement. The party thus became an integral part, not of a new post-capitalist order, but of the capitalist order itself. In this sense its fate was a foretaste of the fate of Europe’s many postwar Socialist and Labour parties. Marx would be disappointed to discover that the specter haunting central and eastern Europe today is not Communism in any positive sense, but the terrifying legacy of so-called Marxist parties, the primary symbol of which was his own image. This familiar bearded colossus is conspicuous today by its absence. While in London it is perfectly respectable to visit this eminent Victorian doctor’s tomb (if a bit macabre), the stern, hairy caricature of communist propaganda is nowhere to be seen behind the former Iron Curtain. Less than contempt, his name elicits a sort of condescension. There is a vague sense of disbelief that someone could still find it worth mentioning him. He is a specter, then, in the sense of being completely invisible, and yet felt everywhere – so, in fact, a poltergeist. If Marx is one of history’s great intellectual victims – cast onto the famous “scrap heap” of which he wrote – he cannot be entirely excused of blame. Marx never solved the many programmatic confusions which underlay his theory of class struggle. This was in part because those confusions were constitutive – without them the theory couldn’t have functioned. Constitutive theoretical confusions are what Marx liked to call contradictions, and for him they were always, in some way, productive. Contradictions were what allowed innovation and change. So it may have been that Marx didn’t want to solve his contradictions; or it might be that he simply couldn’t. In the Communist Manifesto Marx and Engels imagined an incipient world divided between two revolutionary classes – the proletariat and the bourgeoisie – who would align all other classes around them in preparation for a final struggle over the future course and form of the social order itself. The conviction that the proletariat would liberate first itself and then the rest of society was, according to the Polish sociologist Leszek Koloakowski, “a philosophical deduction rather than a product of observation.”7 This impression remained an important influence even on Marx’s late economic works. In Marx’s economic theory, the proletariat is not only vital for capital but also a perpetual problem for it. The production process, where goods are made, adds value to objects, which the capitalist can later appropriate as profit, but even this apparently simple act of accumulation is fraught with danger. In the Grundrisse Marx observes how, “As long as it remains in the production process [capital] is not capable of circulating; and it is virtually devalued.”8 The same applies vice versa in the case of circulation – in circulation (when money moves freely through the market) capital cannot produce the surplus value that comes from labour, which is subsequently appropriated by capitalists. In contrast to its rather dour, earth-bound behaviour in Volume I of Capital (where it is often embodied in the ghoulish, Dickensian villain Mr Moneybags), in the Grundrisse Marx creates an image of capital far closer to how he really saw it: as a kind of wildly creative, but also dangerous expansive, force - one prone, crucially, to bouts of petulant financialisation. Here Marx’s more vivid descriptions create the impression of an addict repeatedly forced to return for more. Every hit must be bigger than the last, just to keep the system going. It is, unsurprisingly, labour – as the uniquely variable element within the capitalist system – that creates this effect on capital. Capital therefore endlessly seeks to reduce production time, as the whole time capital is engaged in production (in the form of industry, tools, wage payments and so on) it cannot realize its value (which is to say, capitalists can’t get their hands on it). Yet when it escapes into circulation it cannot create any new value (as this comes, largely, from labour inputs). Labour, and the production process more generally, therefore has a unique importance for Marx’s economic theory. The early belief in a secret power attributable to the new industrial working classes is thus reproduced in the mature economic theory. So unstable would the capitalist system eventually become that the proletariat would inevitably seize power. This profoundly political view of economic theory – perhaps the only attempt ever to totally systematize the social order in view of its inevitable dissolution– throws up all sorts of problems for those wishing to achieve the political victories it promises. By ideologically binding his economics with a political theory in this way, Marx was effectively trying to overcome the increasing distinction between politics – which was becoming increasingly democratic and participatory – and economics – which was becoming increasingly rationalized and administered by experts (the “dismal science”) more generally. The fact the theory combines political voluntarism - in the form of the organised working class - and economic determinism - in the form of the inevitable decline of capitalist vitality - could not be avoided by those addressing themselves to his legacy. Marx ultimately imagined a “co-operative society based on common ownership of the means of production” – which is to say, a world in which democratic institutions extended into the sphere of production in such a way as to make the process itself democratic. This very abstract picture of industrial, as well as social, democracy says nothing about how such a situation is to be achieved. Indeed, beyond conceding that, during the earliest phases of communist society certain defects will inevitably arise, owing to the fact “it has just emerged after prolonged birth pangs from capitalist society,” Marx gives few clues as to how to tackle these problems. While the “prolonged birth pangs” envisioned by Marx would be given historical content by both Rosa Luxemburg and Lenin as the crisis of imperialism and the consequent First World War, the “defects” Marx had in mind were actually of the extension of typically bourgeois legal norms beyond the socialist horizon. The real “defects” which arose in the Communist movement throughout eastern and central Europe, following the First World War, owed little to bourgeois right, and much more to old-style Jacobin tactics of revolutionary terror. What in effect gave such terrifying leeway to the supporters of terror, coercion, suppression and mass killing within the Marxist tradition was the political failure of the earlier democratic, participatory efforts. Those efforts were extinguished in Germany by a combination of war, nationalism, and fascism, but also by the cowardice of the party leaders themselves. At a more theoretical level, however, the weakness of the mass parties stemmed from their inability to convincingly synthesize revolution and reform into a single political practice. Walter Benjamin would later write of the relationship between modernity and barbarism: "There is no document of civilization which is not at the same time a document of barbarism. "9 Benjamin’s insight is that political phenomena like fascism are not throwbacks to a time of savagery, but actually products of the historical currents of modernity. Against the commonly held prejudice that Marxism is simply a progressive creed supported by a mechanistic, determinist view of history, Benjamin enlists the “tradition of the oppressed” in the service of a “conception of history” that rejects classical notions of progress as dialectically bound up with barbarism. In this view, it is modernity itself which gives rise to the potential for fascism. One might add that the potential for political terror is also bound up with the political projects of modernity. As romantic conservatives so often complain, there have been few modern revolutions which did not result in some form of pan-social violence. Following the distancing of mainstream Socialist parties from outright revolution, the Communist vanguardists stepped in. The October Revolution and the conduct of the Leninist Bolsheviks increasingly became the model for revolutionary parties throughout Europe. By all accounts, most remained heavily persecuted, and embryonic in their organisational capacities, right up until the end of the Second World War. In Yugoslavia Tito's Communist-dominated Partisans won broad appeal thanks to their courage (ruthlessly exploited for anti-Chetnik propaganda purposes) during the Nazi occupation. Throughout the rest of the Balkans - Albania, Romania, and Bulgaria - the tiny Communist parties got their only advantages over other, more nationalist parties, through recourse to the Soviet Union. Only the Czechoslovak party, which ironically benefited from being largely anti-German and grouped with the other national 'majority' parties, broke with the rule by commanding 30% of the popular vote. But as we have seen, parliamentary majorities were increasingly eschewed following the example of the Bolshevik revolution. This was not done wholly out of some commitment to Marxist eschatology, but stemmed from Luxemburg's and Lenin's belief that popular consent could be forged rapidly, through extra-parliamentary means, during a period of revolutionary upheaval. Legitimacy could thus be won through insurrection. Lenin's strategy, when translated into the language of the Hollywood western, amounts to: 'Shoot first, ask questions later.' As high summer turned to autumn in the year 1917 Lenin unceremoniously ditched his earlier clarion call - "All power to the soviets" - in favour of centralized, extra-parliamentary, Party-led agitation. The stirring, if ill-starred, call for immediate industrial democracy of that earlier slogan, had to be replaced as normal life crept increasingly back into the battle-worn Empire. The continued cardiac arrest of the state - or the refusal to let the liberal and socialist majority get on with their parliamentary business - was of paramount strategic importance for the Bolsheviks. This tactical consideration was also at the heart of Trotsky's great contribution to socialist revolutionary practice - the so-called "permanent revolution", or the forcing of a wider social revolution immediately after a bourgeois, political one. This peculiar adaptability, a readiness to utilize whatever practical expedient one has, attests not only to the political genius of both Lenin and Trotsky, but also the remarkable adaptability of Marxism as a political doctrine. Fredric Jameson describes, in his recent book on Marx's Capital, Marx as the inheritor of a peculiar philosophical tradition of action, extending through Aristotle, Machiavelli and Hegel. It was this privileging of action - of the valuing of the material over transcendent laws - which allowed Marx to develop such a complex, rewarding view of the tendencies of capital, and also of the behaviour of political actors within capitalism. On the other hand, this same practicality came into conflict with other, more determinist, rationalist tendencies within Marxism. In their political expressions - in the form of reformist parliamentarism and vanguardist revolutionary agitation and eventually terror - both tendencies of Marxism were ultimately failures. While revolutionary Communism was more spectacularly disastrous, the death of radical Social Democracy has been a quieter, but no less absolute, tragedy. I think that any revolutionary potential on the part of German Social Democracy is rather exaggerated. Revolution was rejected as a viable political strategy quite clearly from the late 1880's onward, and the importance of parliamentarism was never questioned except by the far left of the SPD. The predominant influence in terms of actual political practice rather than high ideology was that of Ferdinand Lasalle, that is the SPD embarked on a quest to find a place in the imperial system for the working class and to secure gradual improvements in working conditions, wages, and welfare provision. Even the orthodox Marxists in the pre-war SPD, such as Bebel and Kautsky regarded revolution as an unnecessary inconvenience: power would be delivered to the working class on a silver platter due to the internal contradictions of capitalism. This was set out in the Erfurt programme which you cite at the beginning of this post. Thus revolution was implicitly rejected as a path to power from very early on in the SPD's life. 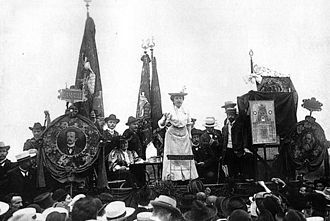 I do not think that Rosa Luxemburg was that important an ideological influence on the SPD even during her lifetime. After Kautsky the most important theoretician was Rudolf Hilfverding who elaborated Kautsky's position of the inevitability of a socialist society without any need for revolution by interpreting the cartelization and concentration of German heavy industry as a process that would in time facilitate central planning and social ownership. If one then skips the first world war and examines what the SPD did as the predominant pro-republic party in the Weirmar period, one would be hard-pressed to distinguish between its policies and and those of the Labour party of Ramsay MacDonald. Both accepted the prevailing dispensation despite some significant achievements by the SPD in the form of the 8-hour day, union consultation in the management of firms and of course the liberal if imperfect Weimar constitution itself.